I’m not sure this is a solution to the recipe-wrangling problem, and since it will cost $299, I’m not prone to find out. If you do, please report on the Demy, claimed to be the first and only kitchen-safe recipe reader. Not quite clear what that means, except wipeable. Room for up to 2500 recipes, and sync-worthy with your account at keyingredient.com. Not available until Might, but you can pre-order from Amazon . I dunno about you, but my treasured recipes are mostly not on the internet. They’re either scribbled on scraps of paper or in elderly grease-stained cookbooks with collapsed bindings. 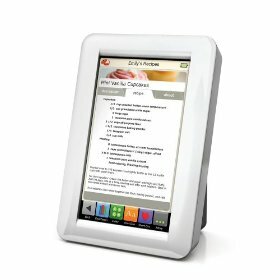 So I’m wondering, could I download favorite cookbooks into a Kindle instead? And then just be very, very careful with the grease?